We are Austin wedding musicians providing elegant, dynamic music for wedding ceremonies and special events! In addition to being a perfect fit for traditional, classical wedding repertoire, our instrumentation of violin, classical guitar, and cello is also uniquely suited for beautiful interpretations of contemporary genres. Our arrangements create a sound that is fresh and vibrant while pairing seamlessly with the elegance of wedding ceremonies. We work closely with the bride, groom, and coordinator for a flawless, natural performance. Our members are highly trained, professional musicians with degrees in music performance and composition from some of the world's leading universities and conservatories. Live Oak Trio provides an unforgettable music experience with a modern twist as unique and original as Austin. We are proud to be a socially and culturally inclusive business and we proudly celebrate our LGBTQ community as well as all religious beliefs and traditions. — Ren Newey, Wedding Coordinator, 36th Street Events. 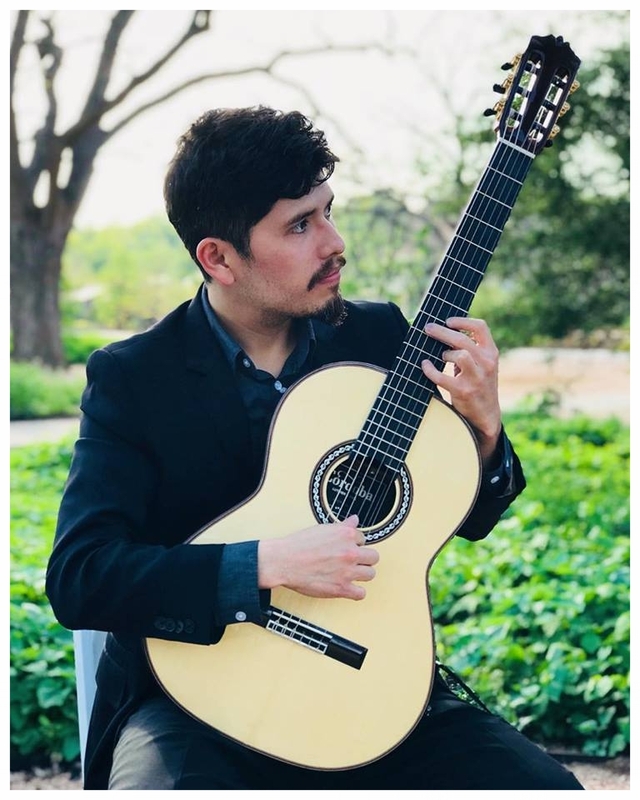 Alan is a graduate of Berklee College of Music and is an active freelance composer and professional guitarist based out of Austin, TX. His extensive performance experience includes appearances with: GO Organic Orchestra, SoundSpace at the Blanton Museum of Art, Austin New Music Co-op, The City Theatre, SLANT Ensemble, and James Anderson Elevation Quartet. His compositions have been performed by ensembles including AURORA Trio Houston, Modus Novus Musica, and the University of Texas Jazz Orchestra. Alan is a member of The American Society of Composers, Authors, and Publishers (ASCAP). Frank is currently an Adjunct Professor of Cello at Concordia University, Austin and is a tenured member of the Austin Symphony. He received his Bachelor of Music degree from the Peabody Institute in Baltimore, studying with Alan Stepansky and continued his studies at Northwestern University in Chicago, studying with Hans Jorgen Jensen, while earning a Masters degree in cello performance with an emphasis on cello pedagogy. Frank received his Doctorate degree in cello performance from the University of Texas in Austin studying with Bion Tsang. He is a dedicated teacher of all ages and ability levels and has served on the faculty of the Northwestern University String Academy, the UT String Project, and as Adjunct Professor of Cello at Andrews University in Berrien Springs, MI. Corina is a violinist and music educator from Austin, TX and studies under professor Sandy Yamamoto at the University of Texas at Austin. Recently, she completed a year-long teaching assistantship in the San Francisco Bay Area with renowned violinist Elbert Tsai. Corina has held the position of Assistant Principal Second Violin with the University of Texas Symphony Orchestra and the Butler Opera Center, and has also performed as a substitute with the Round Rock and Temple Symphony Orchestras. She has worked with acclaimed violinists and teachers such as David Kim, Laurie Smukler, Danielle Belen, Sally O’Reilly, pianist Rohan de Silva, and members of the Miró Quartet. As an avid teacher, she has served on the faculty of the Music Mission San Francisco and the University of Texas String Project, teaching early childhood music, theory, orchestra sectionals, and group and private violin lessons. Corina loves seeing how weddings bring people together, and she enjoys making a couple’s special day memorable through music!